Getting To Know God has four parts. Spend Time With Jesus is called the first part. The second is called What Is The Father’s Will? Lord Jesus Be My Guide is the name of the third part. The last part of this poetry book is called Why Do We Need To Be Thankful. 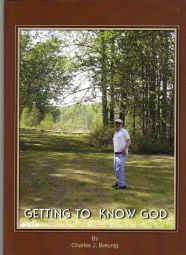 Getting To Know God has 112 poetry prayerful poems. Each poem is inspirational to help you to get to know God. I hope that you enjoy this book and your relationship with God grows deeper. God Bless you and thank you for reading my book of poems. I grew up with Charles, he is the youngest of 7 siblings. Charles and his twin sister are a year younger than myself. Growing up together on the farm in Fairview, Alberta was lots of fun, and Charles was always ready to participate or even to instigate the many adventures we shared. I was always impressed by Charles' determination, courage, and good sense of humor. As we are aging gracefully together, I am even more impressed with him. As an older sister, sometimes it's been difficult to watch Charles struggle through some of the more painful aspects of his life. But through it all, his deep faith and belief in God shines through. Charles finds the goodness and joy of each day. Charles, thank you for sharing your poems with us, they will inspire us to try and live each day as you do, with faith, and with grace. If you would like to send me a money order. Please e-mail me at charles@inspirationalcorner.com for my mailing address. Do to the fact I have a speech problem, I don’t post my phone number on this site. If you have any questions, please e-mail me at charles@inspirationalcorner.com. I would like to answer any questions about my products that you have.